A couple of years ago my die-hard hiker friends told me their little secret. They hike all year round, almost without missing a stride. They hike in the late fall / early winter, when hiking trails start to accumulate snow and ice; in the winter, when the snow has been packed hard by snow-shoers, skin-skiers, or unseasonal rain; and in the spring, when the winter snow melts into streams of hard snow and ice around sections of earthen rock and trail. 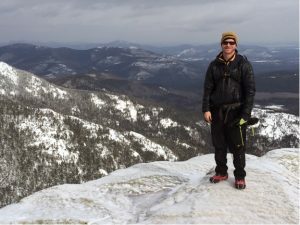 They hike on low-level trails, popular scenic trails, to explore frozen waterfalls or to wander on some of the other 1200 miles of White Mountain trails. Wouldn’t they need snow shoes in the winter, I thought? It must be slippery. How do they navigate around the ice, especially when ascending or descending? Do they wear large crampons and boots that ice climbers wear? That would be a little awkward, I thought. The answer to these questions opened another world of fun for my family and I: MICROspikes! MICROspikes are a light and durable traction system that you put over your boots or shoes to navigate the slippery slopes and trails. They are made of stainless steel, welded chain and shark- like teeth that dig deep into ice and snow for a firm and confident grip. We have used them to walk the dog on icy wooded trails. 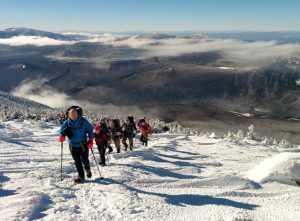 We have used them to hike into Tuckerman’s Ravine at the base of Mount Washington and around the Lost Pond trail. I have even used them around the property in ice storms and for running on low level trails. On many occasions, I sped by people plodding along with snow shoes – they were only using them for traction, as the snow was hard packed. Not me, I was cruising! Putting MICROspikes on and taking them off is as fast and easy as putting on a pair of socks. The elastic rubber slides over your boots or shoes giving a snug fit. If you no longer need them, you can take them off in seconds and store them in your coat pocket or backpack. If you find yourself back on ice, put them on again in a flash. MICROspikes offer safety and confidence when going up and down slippery trails. Anyone who has slid down a mountain trail, controlled or uncontrolled, will know what I mean. It doesn’t happen with MICROspikes. They are simply amazing and easy to use. MICROspikes is a registered brand name by Kahtoola and, for the record, I am in no way associated with them and earn no commission for plugging them. However, it is a product that I endorse because it allows us to have fun outside, whatever the changing conditions of the season will throw at us. If I can’t ski, I can still get out and hike with MICROspikes. I found myself telling this story to a number of different guests staying at the Christmas Farm Inn & Spa over the last few weeks. They had not heard of them before. They all went out and bought some MICROspikes and hit trails like the Mount Willard trail in Crawford Notch, Lost Pond Trail at Pinkham Notch and Diana’s Bath in Conway, all of which I recommended. They all had a blast… so I thought I would share my recommendation forward to friends of the Christmas Farm Inn & Spa. There are a number of brands that offer tractions systems. I have tried Kahtoola MICROspikes, Hillsound Crampons, Yaktrax, and ICETrekkers Diamond Grip. I would only recommend the first two for all purpose and the last two for level surfaces only. Prices range from $30 to $60 dollars. MICROspikes are easier to find, generally. You can find them in the Jackson – Conway NH area at Ragged Mountain Equipment in Intervale, Eastern Mountain Sports in North Conway, on AMAZON and at other outdoor equipment stores. Go have fun! Better yet, come to the White Mountains and have more fun!